A year ago, a couple girlfriends and I took an embroidery class at a small sewing shop, appropriately named Stitch Lab. Embroidering was something I always wanted to pick up, but the thought of needle and thread, or any needlework craft, seemed very intimidating. My Grandmother is incredible with a needle and thread. She could sew anything. Her embroidery and cross stitch work, all done by hand, looked as perfect as if it were done by a machine. I felt like I had a lot to live up to. I realize when you are learning something new you have to be very kind to yourself. Even thoughI know this, when I get in front of people, I immediately feel as if I have to get it right, and perfect, on the first try. I will say, it was a humbling experience. French knots and the stem stitch were the only things standing in my way from my first timer perfection. Immediately after taking the class, I became an embroidery fool. Sitting and impatiently waiting at the Doctor’s office, I would bust out my needle and hoop. Every time I send off a gift basket of jams & jellies, I would throw in a towel. It is therapeutic and relaxing. It forces me to slow down in a wold that is constantly go, Go, GO! The best thing I have gotten out of embroidery is the bond that has been created between my Grandmother and I. Whenever I start a new towel, napkin, bag, etc. I always think of my Grandmother. Would this be something she would want in her kitchen? On her table? 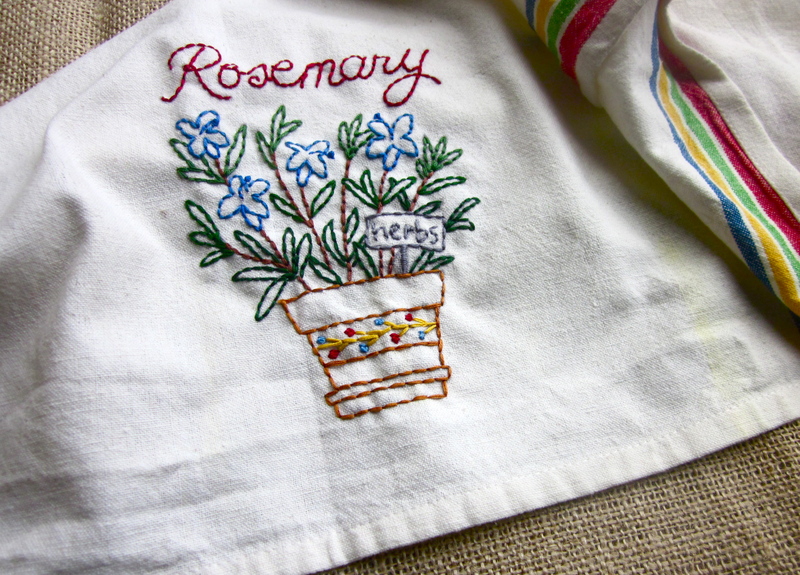 I have been completely in love with embroidering flour sack towels with herbs or produce. I have gotten the Nettie Stamp of Approval. Now, I’m not quite to her level of mastery, but I think I’m on my way! Seems like embroidery is a lost art. I always see so many embroidered items at the estate sales I help out with. French knots, chain stiches, cross stiches, etc. on tea towels, pillows, and more.